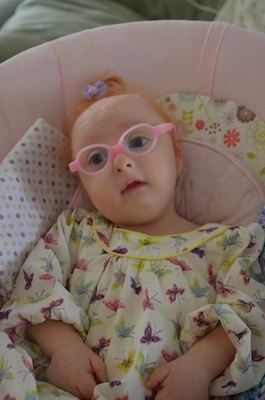 Our daughter, Gabriella, has a very rare syndrome called Microcephalic Osteodysplastic Primordial Dwarfism Type I. She is one of three known children with the disorder in the world. There is a possibility that more children with the syndrome are born in other countries, but most likely do not survive. There have been forty other documented cases in the medical literature since 1930 (worldwide). The average life expectancy is 10-12 months. However, there have been two children to live to the age of five. We are overjoyed to have just celebrated Gabriella’s fifth birthday! Because of Gabriella’s DNA, a gene for her disorder was finally mapped. Testing is now universally available to look for the gene in others. In very simple terms, both of Ella’s parents passed on a mutation in each of their genes that then caused Ella to have a combination of these genes, making it very dysfunctional. The gene that is dysfunctional is the one responsible for telling all the other cells in the body how to dispose of or keep genetic material. This essentially means that everything about our daughter is affected in some way by her syndrome. We call Gabriella “Ella.” Her middle name is Grace…and boy did she teach us about grace! We were not expecting to give birth to a live baby when I was induced at 32 weeks. Ella was so small for her gestational age, and her abnormalities were so significant that her doctors believed she would not survive birth. She was born spontaneously (but at the hospital) with just her father and me in the room. She was born pink, breathing, and attentively looking up at us. Thinking she had moments to live, her father immediately baptized her. Neonatologists, nurses, respiratory therapists naturally ran in to try to resuscitate her, but she didn’t need much help. She was whisked away to the NICU on CPAP. Of course Ella did not look like a normal baby. For starters, she was extremely tiny. Although she was the age of a baby at seven months gestational age (seven months of pregnancy is about 32 weeks gestational age), she was the size of a 25-week preemie. She fit in the palm of our hands. Ella had a sloped forehead and rather big eyes for her head. She had no outer ears, just little holes in her head. She had a high arched palate and always seemed to have stridor or noisy breathing. Some of the bones in her hands and feet were missing and she had no hipbones. Her joints were contracted. Her right leg, from the knee down, was completely turned around, with her foot pointed in the wrong direction. She also had abnormal kidneys and hypertension, and a small hole in her heart. She had very dry skin and no hair, not even eyelashes or eyebrows. Her head was very small. 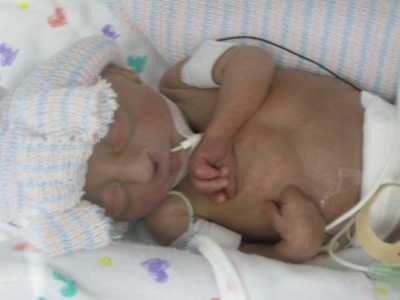 She suffered many of the same issues other preemies have: anemia, sepsis scares, breathing problems. Most devastating, her brain ultrasounds were so abnormal; specialists could not even make out where the structures were. However, Ella did seem to connect with her world. She even took a bottle. She spent four months in two different NICUs. She was discharged home weighing three pounds. She was still smaller than a sandwich! Because Ella’s syndrome is so rare, no one had a guide as to how to treat her or what to expect. We had very little data from previous patients. We struggled with her breathing issues at home. She had (and still has) an extremely narrow and floppy airway. She choked on her secretions. She also suffered from reflux and constant vomiting. She started to eat less and her breathing became more and more labored. She had gone into heart failure at around five months, though medications helped her prevail. Her kidneys were diseased, but functioning. She remained on hypertension medication. Since most of the children in the literature seemed to succumb to infection, we thought that they may have had immunology issues. We became neurotic about keeping Ella away from germs. We kept sanitizer everywhere and rarely took her out. A few months after Ella came home, she was sitting on her father’s lap in the sun. Her head appeared to glow! Of course, we thought that was impossible and passed it off as nothing. We noticed her head glowing at other times though, too…whenever she was sitting near the light. Just before she reached her nine-month birthday, a CT scan was done. A massive fluid-filled cyst occupied more than 90% of her head. The cyst pushed her brain to just a sliver in the back of her skull. We understood why her head was glowing…any light around her would just pass right through the fluid making her head appear to glow! We were, of course, devastated as the prognosis was grave. Everyone was surprised that she had even survived to this point. We went to many of the country’s top neurosurgeons. Living with a cyst this size was unheard of. Most told us that they recommend doing nothing other than call hospice and let her go in peace. We had certainly considered this for a couple of months. But then we realized that Ella desperately wanted to live. She loved the world around her and she was spunky. However, she seemed as if she was more persistently in pain. She screamed all day long. I would sway with her in front of the window from sun up until sun down. We finally decided to have a shunt placed in November 2009. Ella recovered from her shunt surgery quickly. We noticed that she seemed to be in much less pain and was able to enjoy things around her. We continued to struggle with feeding, NG tube feeds, reflux, vomiting, and choking. Ella had an endoscopy and colonoscopy done. It appeared that Ella had an under-developed GI tract and some suspicious immunity cells. We decided to go to an Immunologist to check things out. What we had feared all along about Ella’s immune system was true. She had a combined variable immunodeficiency, meaning multiple parts of her immune system didn’t work. Once again, her doctors were amazed that she hadn’t succumbed to a major infection. Somehow our little Ella continued to beat the odds. She was started on immunoglobulin infusions and she continues to receive weekly infusions to this day. Ella also had a G tube placed in the fall of 2010. Afterwards, we wondered why we didn’t do this sooner. It made a dramatic difference to get the required calories, water, and medication into her. We also didn’t have to place the NG tube all the time. Her nutrition had always been a conundrum. Again, there were no other patients like Ella to figure this out. We let Ella guide us with what we perceived as hunger. We made sure she had adequate fluid from water, calculated her calories, protein, and other vitamins and minerals. Somehow things were working as she maintained a healthy weight for her length once the G tube was placed. One of our biggest issues with Ella has been her choking and gagging, particularly with stooling. I would have to throw Ella over my leg to give her pressure to cough up her secretions while straining to stool. She would turn bright red and purple and give any witnesses quite a scare. This happened multiple times a day. Ella required multiple glycerin suppositories just to pass liquid stool. She would scream in pain and her tummy grumbles were audible. We tried everything…all sorts of medications, massage, changing formula. Ella was finally started on a medication called Neurontin and it changed her life. Ella’s copious secretions, gagging, choking, and abdominal pain have subsided significantly. She still has these episodes, but they are not as often. She is also in much less pain. Ella continues on a host of other medications for hypertension, reflux, gas, anemia, her immune issues, kidney disease, electrolyte issues, and neurological issues. She now has one functioning kidney, and that function is slowly declining. We hope and pray that we can avoid peritoneal dialysis, as she is so tiny and prone to infection already. We continue to be vigilant about infections. We have decided not to send her to school as the risk is just too great. We are blessed to now have a number of nurses who help us take a break and get other errands done. We have been blessed by so many who have touched our lives; Ella’s doctors, nurses, the local pharmacy, her medical supply company, and countless friends and family. Today, Ella at five years old is about the size of a seven-month-old. Because she grows so slowly, she outgrows her clothes slowly—she has quite a wardrobe! She loves to watch TV and her favorite movies are Kung Fu Panda and Bee Movie. She also loves Baby Einstein. Her favorite toy is her Violet puppy. Ella really likes it when people smile at her, especially if they wear big dark-rimmed glasses. What Ella loves most is to snuggle. She loves cuddling and big smooches. Every night as I watch her sleep, I wonder, how did I get so lucky to have such a little angel for my baby? Ella has given us intangible gifts—she has made time stand still for us, she taught us to live in the moment and not take a second for granted, and she has taught us how one tiny little person who doesn’t walk or talk can change so many people’s lives for the better.